Metal roofing and gutter repair service for all suburbs in Sydney. It is not difficult to understand why metal roofs is the ideal choice for roofing in Australia. With the unique weather and climate conditions we experience in Australia, metal roofs is evidently the type of roofing that will stand the test of time. Why Choosing a Metal Roof In The First Place? It is no secret and it is indisputable the roof is the most expensive part to repair or replace for your home. Neither can one underestimate or undervalue the importance of a good, solid, sturdy roof that will shelter you from the elements, improve the construction of your home, and above all, increase the value of your home. Because roofing is expensive, it is paramount to make the right choice from the start. There are numerous benefits for making use of metal roofing. What Types of Roofs are Best Suited for Metal Roofs? Metal Roofing is ideal for homes that have either a flat or steep roofline and it offers durability that is hard to match. Some types of Metal Roofing materials may be applied over an existing roof without the need for tear-off or additional structural support. One of the main benefits of installing Metal Roofing in Sydney is the many roofing style and options that you can choose from. Tin, zinc, aluminum, copper and galvanized steel are all Metal Roofing options. You are able to customize your roof based on the durability, style and price that you are looking to obtain. What are the Benefits of Installing Metal Roofs? The main factor that homeowners consider when looking for a roofing option involves longevity and durability. You want something that will stand the test of time and last. Metal roofs have been found to last up to 40 – 70 years. This is much longer than traditional asphalt roofing. Metal roofs can also withstand strong winds and is a resilient roofing type. You will not have to worry about maintenance and upkeep on your roof. 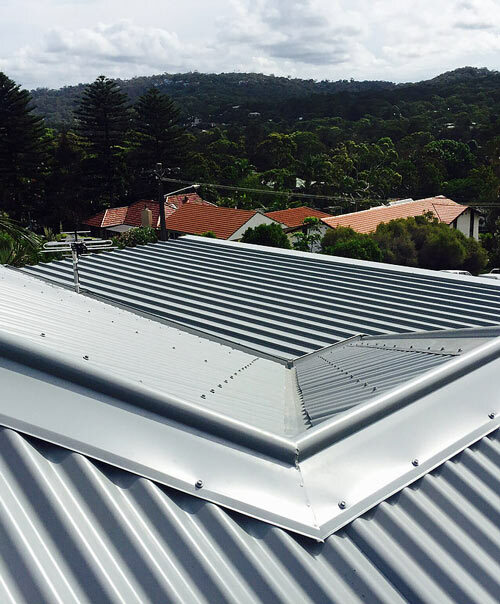 Metal roofs has been in use for centuries and with the extreme and harsh weather we experience in Australia, it is evident why metal roofs are a preferred choice and how they top all the major important qualities one would want from your roofing. 1.1. Suitable to provide protection for all weather extremes such as hail damage, heavy snow, high winds, and heavy rainfall. 1.2 Comparing strength and durability to other roofing options. Metal roofing can resist corrosion with excellence because of the incorporation of galvanised coatings, aluminum or zinc. 1.3 Fire and insects are no threat. Metal roofs can not burn and insects or pests has no benefit from it. When cost is considered it is simply understandable that a metal sheet is able to cover a larger area. The sooner the roofing area is covered the sooner the work is completed. Thus faster metal roofing installation equals less labor cost. A Metal Roof System is an energy efficient roofing type, because it reflects solar heat and can cut back on cooling costs immensely. Metal Roofing is great in snow country because it is fire resistant, lightweight, and excellent at shedding snow. Metal Roofing is lightweight compared to tile roofs at 750 pounds per square (an area equal to 100 square feet) or concrete tiles at 900 pounds per square. With the light weight of metal roofing, the structural demands are not high as it possibly could be if you use other heavier roofing materials such as tiles or concrete. Most Metal Roofing materials come in multiple-shingle sections or in 12 to 36-inch-wide panels. An accomplished contractor can install these quickly. With a storm looming, shortening the process by a day or two may have a critical advantage. Very long gone are the days that a metal roof was one size fits all, and be happy. The options are endless and the variations available allows you to let your creativity go wild. When appearance comes to mention, it would be an oversight not to mention Colorbond steel. Colorbond steel allows you to compliment the choices of other building materials or simply choose a great looking colored metal roof for your home. The advantages from Colorbond is endless and vouches for a discussion of it’s own. Colorbond roofs are oven baked which gives you the peace of mind that the color of your roof will remain vibrant with no fading, flaking, or cracking. With the proper insulation metal roofing provides outstanding thermal protection. It will help you stay cool in the scorching hot summer and snug and warm in winter. If you live in predominantly hot areas, make sure to choose a light color that can reflect the heat away from your home. Because metal roof materials are noncombustible, they typically have a Class A fire rating. But part of a roof’s overall classification depends on materials beneath the surface that could ignite in intense heat. Metal reflects radiant heat from the sun, minimizing midday heat gain. This means you save energy needed for air conditioning during the day. Though the material itself is low in insulation, many systems utilize a dead-air space between the metal and roof deck to increase energy efficiency. This is due to the way the panels interlock and because the surfaces are hard and slippery. In the end, regardless what your reasons for your choice of metal roof are, ensure you make use of a reputable metal roofing contractor in Sydney that is able to install it correctly and effectively to make sure your investment last for decades to come.